LENGTH X WIDTH X HEIGHT: 169.9 x 69.9 x 57.1 in. CARGO CAPACITY: 18.0 cu. ft.
BOTTOM LINE: Toyota has added a hatchback to its popular Corolla line, and the decision is a good one. 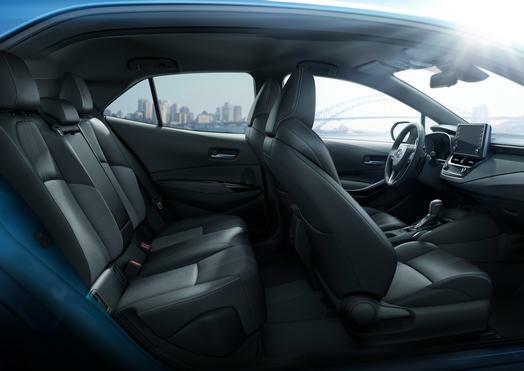 Not only does it give the Corolla added cargo capacity, it seems to make the car more stable. 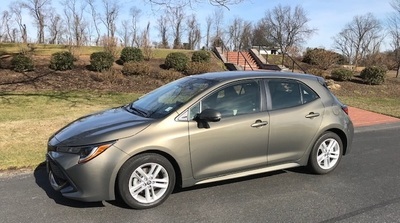 I have driven the Toyota Corolla in the past and found it to be a capable small sedan. Technically, it’s a mid-size because of its total passenger volume, but in reality it’s a compact. 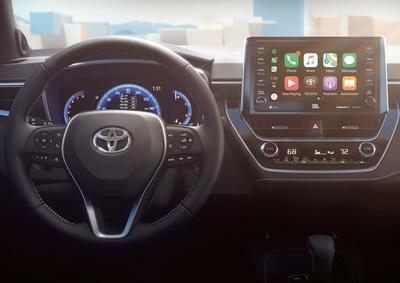 This year, Toyota has added a hatchback to the line and it has totally changed the character of the vehicle. Not only does the added structure in the back add cargo capacity, it gives the Corolla more structure and actually changes its character. Cargo capacity under the hatch is 18.0 cubic feet, which his more than the 13 cubic feet in the sedan’s trunk. Fold down the rear seat backs and cargo capacity increases to that of a small (okay, very small) SUV, but you’re still working with a lot more than the sedan offers.. The only issue we had with the Corolla Hatchback had nothing to do with the hatch. Even though ground clearance is 5.1 inches, we discovered that we were bumping the lower air dam into “sleeping policemen” that define parking spaces. Obviously, an owner who would be more familiar with the car would probably not have that issue. Under the hood is a 2.0-liter overhead cam inline four that’s rated at 168 horsepower and 151 lb.-ft. of torque. This is good power. The engine is buzzy on acceleration, as most fours are, but it’s surprisingly quiet going down the road. This can be attributed to either good engine design or abundant use of sound deadening materials, but whatever the reason, it works. Front seats are comfortable with good side support. Our tester had cloth seats with black inserts and light grey surrounds. I constantly felt as if I had left something on the seats. However, it does work well with the overall interior design. Front seat passengers can make use of sun visors that have extensions that help keep the sun out, especially when it’s coming in a side window. I should make a comment here about the exterior color. Toyota calls it Oxide Grey Metallic. It’s a unique color that works well. Rear seat legroom is cozy, although headroom is good. Center passengers, if there are any, would be uncomfortable with the tall center hump. Easy rear seat back releases create a flat cargo floor. The driver faces a clear instrument panel, with a central speedometer, smaller tachometer on the left and a digital speedometer on the right among many options. There is a clear infotainment screen. Our tester had the larger 8-inch touchscreen. There is the usual assortment of options with easy navigation. In order to make the best use of the infotainment system you should have the Entune app on your phone in order to pull up the map function. The wheel has the usual functions.including cruise control. Oddly, the Corolla Hatchback didn’t have the standard Toyota stalk-mounted cruise control switch. The hatchback design of the new Toyota Corolla Hatchback almost converts the Corolla into a mini station wagon with an easy opening hatch that isn’t powered, but it’s light enough. Toyota missed the boat, though. The lifter could have been integrated into the Toyota badge instead of at the bottom the hatch itself.